A metal object of unknown origin fell down on Earth in the Brazilian state of Maranhao. The unusual event caused panic among the local population. 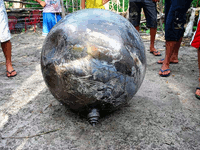 The ball-shaped, 30-kilo object about one meter in diameter was found on Feb. 22. Residents of the village of Riacho dos Pocos were the first to have seen the space ball. Jose Valdir Mendes said that he had heard the strong roaring sound on Wednesday morning, at about 06:00 local time. Several moments later, an explosion occurred near his home. The man got frightened and ordered his wife not to go out. However, the man was very curious to see what was happening outside, so he went out. He found the strange object in his garden. It appears that the ball is made of metal alloy. The object has a small opening in it. Inside, the ball is hollow, but there is something hidden inside the ball. The locals tried to lift the ball and shake it, and they could feel that there was something moving inside the object. Fortunately, the ball did not injure anyone during the landing. The bizarre space object caused some damage to the Mendes family, though. The ball left a crater in the ground and harmed a cashew tree. The rumors about the mysterious ball from space have already reached neighboring villages and towns. Crowds of people have been coming to Riacho dos Pocos for two days already to take a look at the strange object. "The townsfolk say that the roar was terrible. Some believed that it was the end of the world, others thought that it was an alien spaceship landing. I personally think that it is a fragment of a space satellite," O Imparcial publication quoted local professor Max Mauro Garreto as saying. Indeed, the metal ball that crashed on Earth in Brazil looks like many other objects that fall down on the planet every now and then. Something like that has recently caused panic in Namibia. A metal sphere weighing nearly 6 kilos was found in the middle of December in Nabibia's Omusati province. The local authorities classified the object and asked NASA and ESA for help. Independent experts said that the Namibian ball was only a 39-litre fuel tank from Europe's Ariane booster rocket. A similar ball crashed in the north-west of Colorado, the USA, in the beginning of 2011. The mystery was unraveled quickly. The Cyrillic inscription on the surface of the object said that it was a tank of the pressurization system of Zenit- 3SLB booster rocket. TCC - I would think this is some kind of space Junk but still interesting. I wonder if anyone will come forward and claim it. Sphere from Namibia in 12/11. Looks similar to Brazil Sphere. yeah it does look like this one...weird.